Our Nautical Single Mast Series presents flagpoles of various heights ranging from 20’ to 50’. 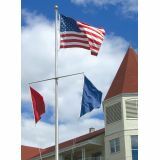 Designed to withstand the high speed wind, these flagpoles with a nautical theme design make a popular design in coastal towns and seaside communities. Offered with all the standard accessories like Gold Anodized Aluminum Ball Ornament, Cast Aluminum Revolving Truck w/Pulley and Aluminum Yardarm w/ Pulleys & Mounting Hardware among others, these flagpoles are offered in both anodized and satin finishes. The single shaft and yardarm makes flag hoisting easy while the design that resembles a sailboat's mast will accentuate the settings perfectly. Buy right away!